I said getting out of debt is mostly about behavior. Ironically enough though, it doesn’t begin there. The first step on how to get out of debt begins with your attitude. The choice to get out of debt begins on the inside, in your soul. There has to be a fire burning hot and heavy that will push you to take on this task with reckless abandon. No halfhearted, lukewarm, wishy-washy effort is going to cut it. You have to get fired up! If this doesn’t happen, you will never make it, plain and simple. I emphasize this as the starting point because the debt-payoff-journey is a tough road. It’s filled with ups and downs and financial and emotional setbacks. There will be questions that have no immediate answers. The journey will play tricks on your mind and lead you to doubts as to why you are on the journey in the first place. In those moments, you will need some hot coals of emotion that continue to burn. And those hot coals of emotion need to be directed at your enemy – the debt. So get emotional about it. Look around and realize how debt is ruining your life, or at the least, holding you back from accomplishing your dreams. Tell debt you are going to kick its tail and be done with it. You simply can’t let it win. When I reached a chunky 200 lbs. several years ago, it became obvious that was more than my 5’11” frame desired to handle. Sluggishness, high blood pressure, and poor eating habits all ruled my life. I didn’t like the look or the feeling and I knew if something didn’t change, I might have health issues later on. So after getting angry about my situation, I worked on removing the bad habits. I ate better and took vitamin supplements. There were fewer late night snacks before bedtime. I got off the couch and started running. I ended up losing 25 lbs. and have now settled into a comfortable weight for my body size and age. I eliminated the things that led to my condition, which is exactly what you must do with your debt. The first behavioral step to get out of debt is to cut off the debt itself. It is especially relevant that you avoid taking on any more debt. Period! It’s as simple and basic as that. You can’t keep adding to the depth of the hole you are already in. This won’t be easy and it may require tweaking how you pay for things. It might sound drastic but you should probably cut up your credit cards. You can pay for things with a debit card or with cash. It’s not the end of the world. This may feel like it’s already getting tough and we are only on step #2. But this is a critical step. You can’t climb your way out of the hole you are in if you keep adding to the hole. The third step of how to get out of debt is to save any little bit you can pinch out of the monthly budget. Developing an emergency savings fund at the beginning will help you stave off going into more debt. You will have built up some cushion so when emergencies come you can pay for them in cash instead of putting them on a credit card. Step #3A: Sell some stuff. Look around your house for things you are not using. Ask yourself, “Do I need that thing more than I want to get out of debt?” If the answer is “No” then get rid of it. If the answer is “Yes,” ask the question again, just to make sure. Have a garage sale. Put the items on either Ebay or Craigslist. Take things to a consignment store. You need to raise cash quickly to establish that emergency fund. Selling items is the best way to do that. Step 4 of the how to get out of debt process will vary from situation to situation. Some people may not be able to take on a part time job due to the time commitment involved. Perhaps your current job will bring in the necessary funds to pay off the debt in a reasonable amount of time. Or maybe you conclude the extra time spent away from your kids won’t be worth the extra money. It’s still a step in the process that needs to be evaluated. And if you decide to take a part time job, realize it’s not forever. This will be something you do only to speed up the debt payoff process. Once the debt is gone, so is the job. And if you can’t take on a part-time job, realize it’s OK. You can only do what you can do. Don’t beat yourself up about it. Your journey might take longer if you can’t make more money but you can still make it. Way #1: Choose the highest interest rate debt and pay that off first no matter how large it is. Follow that up with the next highest amount and so on until the lowest interest rate debt is paid off last. Main Pro: By attacking the highest interest rate debt first, you are paying off the one that is costing you the most money. Main Con: If it’s a large debt amount (like a school loan), it may take a very long time to pay off the first debt. That can be discouraging. Way #2: Choose the smallest debt amount and pay that off first. Then follow that with the next largest and so on, saving the largest debt amount until last. Main Pro: You get some of the small debt amounts taken care of quickly which can be a big psychological victory. Main Con: You may pay a little more interest over the life of your debt payoff plan. Related Content: Is the Debt Snowball Method the Best Way to Pay Off Debt? You must decide which payoff plan will work for you. I prefer #2 when telling people how to get out of debt because the psychology boost that comes from seeing those small debts quickly fall is really powerful. It helps keep the inner fire burning and creates momentum for the rest of the journey. Either way, you are paying off debt and that is always a good thing. In conclusion, understanding the steps to get out of debt is the easy part. The behavioral change that needs to take place is where you will face the biggest challenges. However, debt doesn’t have to beat you. You can win! Take control of your life today. The road to financial freedom is waiting for you to take the journey. Questions: If someone asked you how to get out of debt, what would you tell them? For those that have paid off your debt, what was the toughest part? If you are in the process of paying off debt, what has been the best victory so far? For those who haven’t started paying off debt yet, what’s holding you back? I would agree with everything you said. If I had debt I would make it my “job” to get rid of it. Earn more and spend less and just keep at it until it is gone. It’s not fun but what a relief to get out from under it! Having debt is normal, but having a debt-free life is achievable. Dealing with large amount of debt can be challenging. Life can be more wonderful without debt. There’s really a way to be debt-free, and all you have to first is to be willing to do what it takes. I often wonder what is normal and what is not. I’m afraid in the case of debt, society has made us accept it as normal. You can live life without it if you are committed to the idea of doing that. ― J. Reuben Clark Jr. Awesome post here Brian! I know that getting angry we had allowed ourselves to fall so deep into debt was a major factor in helping change our behavior. It’s a long process but it’s the good fight. Thanks Ryan! Emotion plays such a role with our personal finances. It can drive us to make poor choices with money or fire us up to do something good about a situation. I agree with your assessment, getting out of debt is worth the fight. How many people actually checked that there was a debt that you owed before you “paid” that debt? The sad thing today is that almost all “debt” is not your debt at all. As the USA is bankrupt (since 1933) you cannot accrue any debt… only a liability. This includes credit cards, loans, student loans etc. When you apply (legal def’ to beg) for a loan you actually create the “money” that the bank then lends back to you. Most people haven’t got a clue what money is or how it is created. Your application IS the money that you then gift to the bank. Learn what money is and you will soon see that you are all very very rich indeed and have NO debts at all. If you were to ask the bank to prove that they DID lend you something… you would make a much bigger step to getting debt free than saying no to trips or going out with friends etc. Have you ever asked yourself “If i’m borrowing some money, why does the bank only extend to me credit?” The very sad thing is that people don’t know the difference between money and credit. If you asked for apples and got oranges would you just accept that? If you simply stop paying “your debt” and let a debt collector buy the debt, you are instantly debt free and for free! The debt collector would have paid the debt off for you and the original creditor (the bank) will have discharged the debt… this means no more debt owed. You then just need to ask the debt collector to show you were you agreed to pay them for paying the debt off for you. Works every time! Think about it. If I paid all the debt off for every person who visits this site would those people be liable to me or not? Of course not, we never agreed that they would pay me back a single cent BEFORE I paid their debts for them. We should stop putting so much into the “credit score”. It is only a measure of how good you are at being fooled into thinking you owe money to somebody. The higher your credit score the more ignorant (without knowledge) you are in your financial matters. So if you need an apartment and your credit score is low… get a guarantor. Need a job and your credit score is low… find a job that employs you not your credit score. The hardest part for me was saying “no” saying no to my friends when they wanted to go out, saying no to my dad when he wanted the bf and I to go on a family trip, saying no to myself when I wanted to buy things. “…saying “no”…” Boy, that’s a big one KK. It’s a huge key to paying off your debt. Thanks for bringing that one up. Wonderful tips here, Brian. For us, now nearly 9 months into our journey, and it’s a heck of a mountain we’re climbing, we are just happy that we’re still working at it. Like you mentioned, it’s such an emotional journey, and I think that’s why so many people give up. We’re chipping away at our mountain more slowly than we’d like, but we’re focusing on the fact that the mountain is indeed coming down, no matter how slowly, and I think it’s important for people to remember that every step really does count. Thanks Laurie. It’s awesome that you have found the willpower to stick with it. I think you are right in that many give into the negative emotions of process and give up. I think I remember the statistic from Dave Ramsey that the average person doing their plan pays off all their non-mortgage debt in 18 months. Whether or not you reach that average really isn’t the point. Your dedicated and working on it the best you can. That’s pretty much all one could ask. Great job! Great tips, Brian. The approach I’m taking is essentially increasing income. I’m trying to build the revenue I’m bringing in from Young Adult Money, and this has come with a lot of sacrifice on evenings, weekends, and (very) early mornings. Now that it’s an established site I was faced with the choice of paying more for writers or just working longer and keeping the money. I’m going to have two weekly writers, which will definitely cut into the revenue but will allow me more time to look into monetization and marketing techniques. Okay, I got off topic here but essentially I’m motivated to increase my income to pay down debt! Increasing income is where the real sacrifice takes place. It’s not incredibly difficult to sell stuff and cut expenses from the monthly budget. It’s a much bigger deal when we start thinking about giving up our time to take on a part time job. It’s a huge sacrifice to do that, especially for people with kids at home. For me, I attacked my student loan by paying off a few of the smallest ones first. Once I started keeping close track and seeing the progress I was making, I got really motivated and started paying down the ones with the highest interest rates. Because I was so motivated, it made it a lot easier to sacrifice what I needed to in order to put the money towards my loans. The continued boost of motivation through having small successes is the reason I like the second approach to paying off debt more. It builds confidence to tackle the bigger amounts that are to come. I like you forking the road between the two options of paying off large debts or small debts first. Obviously, whatever the highest interest rate is normally is wisest to pay off first. BUT, getting a couple small debts off your list is surely a psych boost!! I’ve heard great opinions on either side of that issue. The biggest deal is that people do something. Letting debt continue to pile up should not be an option. Step two is crucial! And one of the hardest steps! I agree. You can’t gain any ground if you keep digging the hole. I went through all those steps. I think taking on more work was the hardest because it meant more time away from family, but I knew it was only for limited time and was worth it to be out of debt. I can’t believe you ever were overweight. Congrats on slaying that demon. “…taking on more work was the hardest because it meant more time away from family.” I agree in that’s the toughest decision of the steps I outlined. So many factors need to be considered in that step, like amount of debt, kids ages, spousal support (or lack thereof), time available for more work, etc. Great post, Brian! 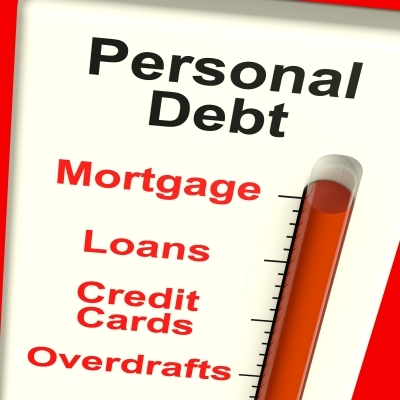 It’s so true – many people are blissfully unaware of the danger of their debt. Or it feels so overwhelming that they are frozen and don’t know what to do. Getting angry to rev up your pay off debt spirit is a good start. And while it’s important to recognize the behaviors and actions that created your debt, you don’t want to continuously beat yourself over your mistakes either. That doesn’t move you forward. Acknowledge, learn and move forward. “…you don’t want to continuously beat yourself over your mistakes either.” Right on Shannon! That’s why the anger needs to be directed at the debt, not at yourself. That might seem like a silly distinction but it’s critical. Make the debt your enemy. I think the problem is people get into debt impulsively and once they’re in it, they don’t know how to get out of it. I also think that people accept being in debt as a norm and think that’s just a part of life. I know that for a fact because that’s how my family raised me and I watched them struggle with debt and I thought to myself that there has to be something better then this. “…people accept being in debt as a norm and think that’s just a part of life.” I think you are right on there! That’s mostly a result of culture and upbringing pushing those patterns of behavior on us. That makes it doubly hard to go in a different direction when that’s all you’ve known. Getting out of debt then feels weird and abnormal, which is actually a psychological barrier to overcome in itself. The toughest part is when you don’t feel like you’re putting a dent into debt. Like you have a LONG way to go. Same is true of weight loss so I like the analogy. It’s a long haul, so being kind to yourself in the process is key. That’s true Tonya…those larger debts take a great deal of perseverance. They can take so long to complete. That’s why I think it’s best to pay off the small ones first to develop the training and discipline needed to tackle and stick with the larger ones. The toughest part was just doing it. It is so easy to keep going with the status quo. Unfortunately, it can kill you emotionally and physically. Nice article Brian. It’s incredible how easy it is to get into a rut and how difficult it is to pull ourselves out of that rut. Takes a lot of desire to want to change course and face all the obstacles. I haven’t really dealt with debt specifically, but I think some of the principles are the as other long-term financial goals. I kind of feel like a broken record on here, but I think the most powerful thing you can do is automate whatever you can. Willpower is great, but it’s also easy to overcome. Make things happen without you even having to think about them and bypass the whole issue of willpower and desire. I agree Matt…automation of bills, savings, etc. is a great tool that can help with the process. It can keep you on course in the moments you are weak and don’t want to go on.